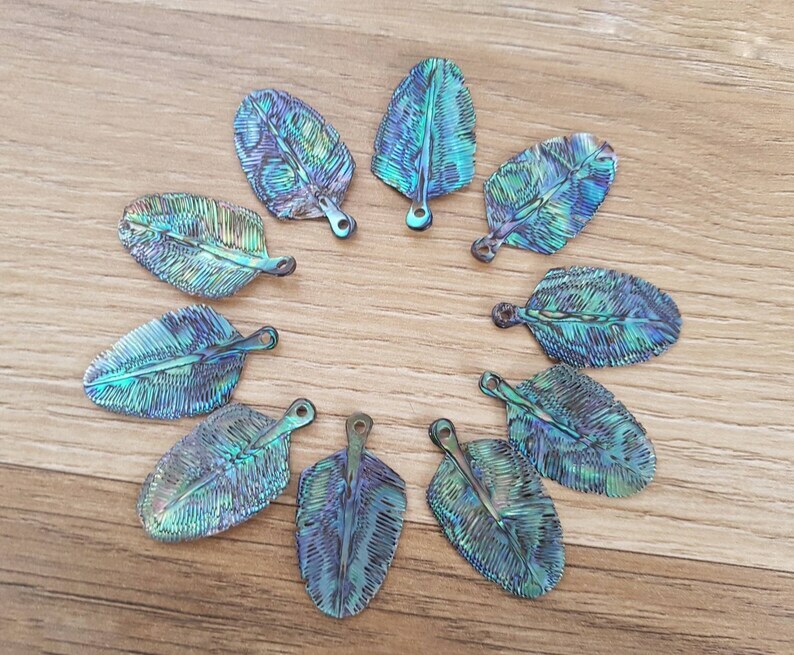 Join us in the feather tribe with this beautiful wholesale lot of 10 hand carved abalone shell eagle down feather neckalce. All natural shell, in beautiful iridescent rainbow patterns, predominantly blues and greens. These come in two sizes; Small and Mini. The eagle down feather is modelled on a real eagle's down feather. The down of birds is a layer of fine feathers found under the tougher exterior feathers. Down feathers were used by indigenous North Americans for religious ceremonies and as powerful symbols. In the stories of some cultures, the down feathers of an eagle were important gifts given by the bird to the hero. This small but powerful necklace promotes inner strength, growth and bravery. This one is the smaller of the two abalone eagle feathers we sell. We also have a Small version. This shell comes in a 'Flight Feather' model also in Small and Mini and Super Mini.